Gluten free brand – FREEE by Doves Farm – is a part of a family-owned business founded by Clare and Michael Marriage some 40 years ago from a shared interest in organic farming, all things grains and nutrition. Around this time, Clare’s mother became ill and was advised to follow a gluten free diet. 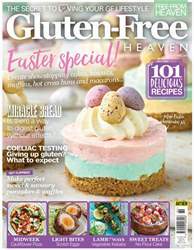 This was an era when gluten free food was unheard of and there was very little accessibility to ingredients such as gluten free whole grains, lentils and brown rice – you had to go to special health food stores and nothing was readily available like it is now, which made mealtimes a real challenge. Most of all, Clare’s mother missed having bread and cakes, so out of necessity Clare decided she would use maize crops produced on the family farm on the Wiltshire/ Berkshire border to start milling and making gluten free flour. It worked, and so the idea for what was to become the FREEE by Doves Farm brand was born. Early on, Clare and Michael made it their mission to create gluten free flour alternatives as good as their wheat-containing equivalents, allowing life to be easier for those who follow a gluten free diet.